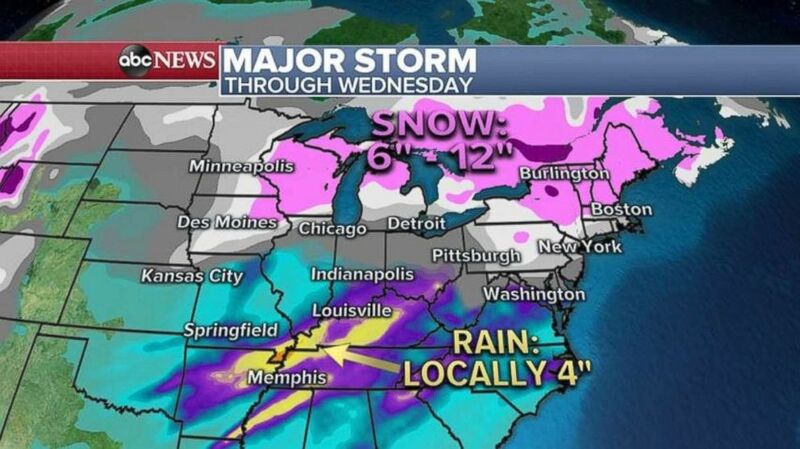 A major system from the West is making its way east. More than 14 inches of snow fell the last few days in Seattle, marking the snowiest February in the city's history as powder also fell in Portland, Oregon, and throughout the Sierra Nevada Mountains. Snow and ice fell in Iowa, Minnesota and Wisconsin, with some regions seeing 8 inches. Even Hawaii saw its share of active weather, with wind gusts of up to 60 mph, as the summit of Muana Kea recorded a gust of 191 mph. 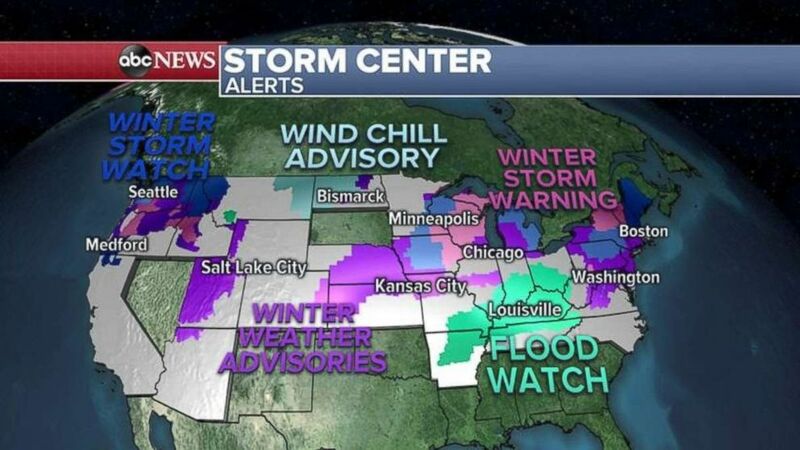 This morning, 37 states are under alerts for snow, cold or flooding. (ABC News) More than three dozen states are under snow, cold or flooding alerts Monday morning. A comparatively weaker storm system is moving through the mid-Atlantic this morning, resulting in slick roads from Washington to Philadelphia. But a new major storm heading out of the West has its sights set on the Midwest and Northeast. The South, meanwhile, will see mostly rain, some of which could be heavy and lead to flooding. (ABC News) A major storm out of the West is taking aim at Midwest and Northeast. Heavy snow is forecast to begin tonight from Kansas up to Michigan, with areas south of there, including the Ohio River Valley, experiencing significant rainfalls. Areas from Chicago to Detroit may see freezing rain, as by Tuesday morning, heavy snow will head northeast into Philadelphia and New York City. Washington may see more rain. 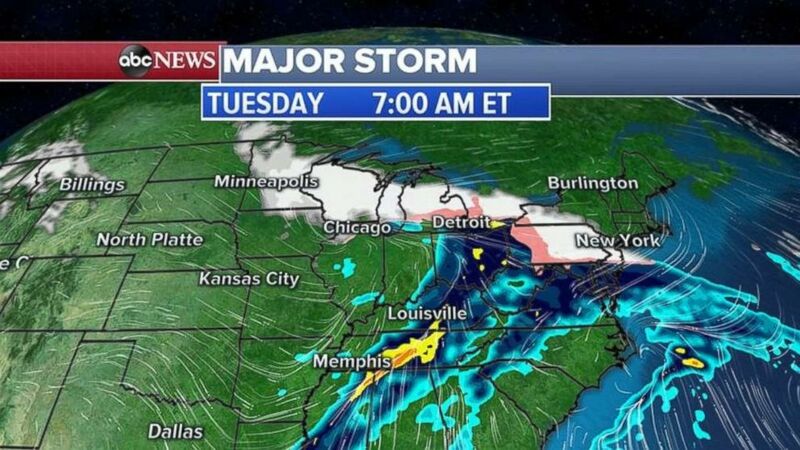 (ABC News) By Tuesday morning, the major storm will stretch across much of the eastern U.S. Heavy snows in Philadelphia and New York will be short lived as warming temperatures produce more rain from the storm system. Boston may see some snowfall beginning in the afternoon. Minneapolis is likely to see at least half a foot of snow, with Green Bay receiving as much as a foot. More precipitation is expected along the East Coast, with portions of the inland Northeast potentially seeing more than a foot of snow. 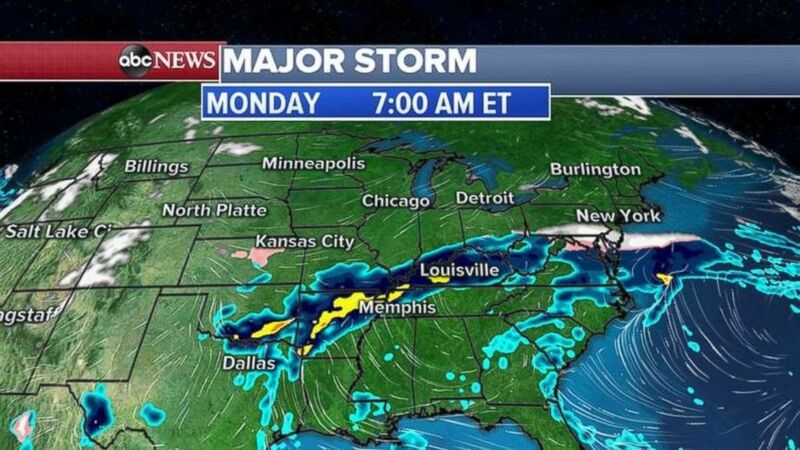 South of there, from Arkansas to the Tennessee Valley to the Ohio River Valley more than 4 inches of rain may fall, which could produce flooding. (ABC Newsq) Some areas could see a foot of snow through Wednesday.